When his fiancee is kidnapped by human traffickers, Roman and his ex-military brothers set out to track her down and save her before it is too late. Along the way, Roman teams up with Avery , a cop investigating human trafficking and fighting the corrupted bureaucracy that has harmful intentions. “Mia, you shouldn’t have done that! 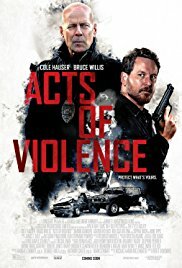 “Acts of violence” is nothing more than a retarded, boring and totally implausible crime film in which serious topics such as PTSD and odious human trafficking are used as fait divers. In addition to the brainless content, I was constantly annoyed about, you can see for the umpteenth time the downfall of a former action hero. Bruce Willis manages to pick out one inferior, meaningless B-movie after the other. I guess these films only have to meet one requirement. And that is that he only needs to show up on the set for a few days. Again, his presence on the screen is limited to a mere ten minutes. Not accepting a drink is equal to being kidnapped apparently. The reason for the outburst of excessive violence is the abduction of Mia (Melissa Bolona) who, during her bachelor’s night, opened her big mouth when a couple of hooligan-looking loudmouths wanted to buy her a drink. She had better kept her mouth shut, because these two hotheads kidnap not submisive girls and deliver them nicely to their cruel gang leader Max Livingstone (Mike Epps), who earns his daily living by exploiting innocent girls and dealing drugs. Drugs in which a specific sedative is processed. A sedative that’s being used to knock out elephants. In reality, this is also a nuisance and a difficult challenge to tackle in the global opioid epidemic. They are ready to rumble. What these criminals failed to take in account were the MacGregor brothers Deklan (Cole Hauser) and Brandon (Shawn Ashmore). Especially Deklan who seems to be in combat mode all the time. Both are ex-military and I guess they’ve gained a lot of experience from foreign missions. And Deklan is still suffering from that. He’s a walking time bomb with a short fuse. The benjamin of the family is Roman (Ashton Holmes), whose militaristic knowledge is being refined at record speed. I also wonder if it’s normal for ex-soldiers to have a weapons arsenal of that size so they can start a small one-man war. Those brothers succeed in taking down those criminals over one night. Bruce Willis is the frustrated police detective James Avery, who hasn’t managed to gather hard evidence after all those years to put the criminal Max behind bars for a long time. Or is his research counteracted from the top? No idea. But no worries James. The brothers MacGregor are perfectly successful in finding out most of the facts in a very short time. How the gang works. Where they usually strike. And the fact that those who try to escape, end up at the bottom of a lake. They may also count on the goodwill of James. He turns a blind eye so they can deal with the gang like outright avengers. As pure G.I. Joe’s they start mowing down their moronic opponents. This was a pure waste of time. Luckily it didn’t take long. Biggest plus is the duration of the movie. This waste of time doesn’t even take an hour and a half. Many times I’ve regretted to see the end credits of a film. With “Acts of Violence” the only thing I did was breathe a sigh of relief. And to be honest, in the end I had trouble remembering the opening scene. Trust me. You won’t miss anything if you don’t watch this crappy movie. I have to say that as a vet, hell yes, most of us have an “arsenal” of weapons like that. Also, keep it down on the stupid remarks about us. But you seem smart, so, do you know who or where that quote was from at the end of the movie? I haven’t heard it before.